Following these Steps for Vacuuming your Area Rugs can help make them last longer! Dirt particles have sharp edges that damage the rug fibers. Over time, these sharp edges act like little knives wearing down the rug pile. Have you ever seen a bare, worn area on an old rug? An area like that is probable in a traffic area where dirt has collected and ground into the rug fibers. Removing dirt particles not only cleans the rug but helps protects the fibers from those little sharp edges. Corners and fringe on area rugs get caught and pulled into the beater bar of a vacuum. To help save the fringe and corners from damage, it is important to vacuum across the rug; side to side and not end to end! The front of the vacuum head is where the suction pulls in dirt. 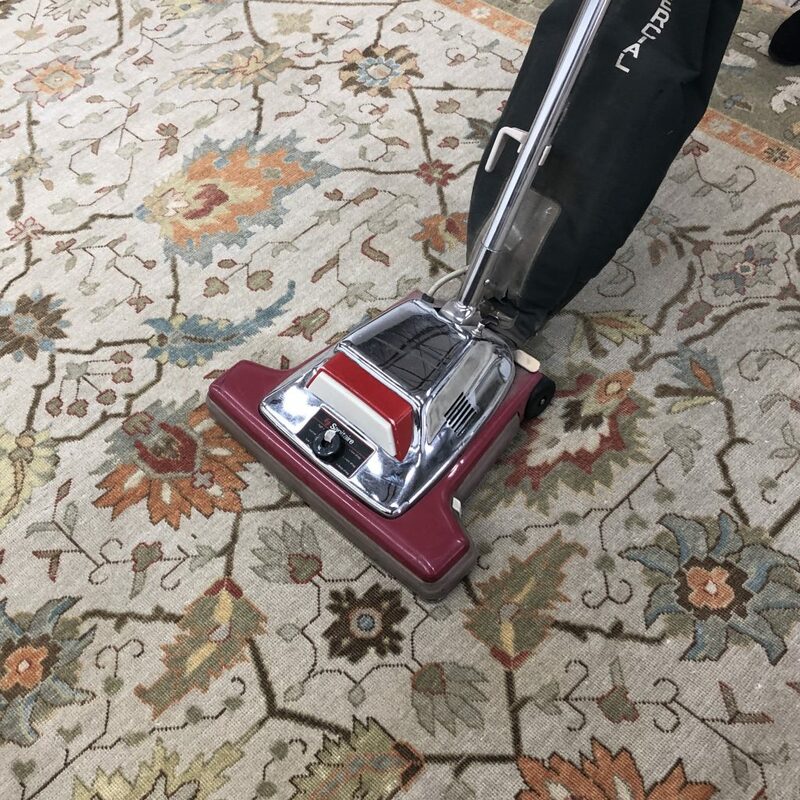 As you vacuum across the rug the minimal suction from the sides of the vacuum head does not pull the fringe or rug corners into the beater bar. After you have finish vacuuming, you should use a brush or comb to clean and straighten the fringe. How often you vacuum your area rugs depend of their location and use. Rugs you don’t live on every day only need to be vacuumed once a week; while foyer, kitchen, bedroom and family room rugs will benefit from more frequent vacuuming. This keeps the sharp dirt particles from building up causing damage to your rugs. For lighter usage rugs a longer time between vacuuming is perfectly fine. Rotating your area rugs every year helps even out wear and walking paths. Using a quality pad under your rug can also help extent their useful life. Following these Steps for Vacuuming your Area rugs can keep your rugs healthy and looking beautiful.